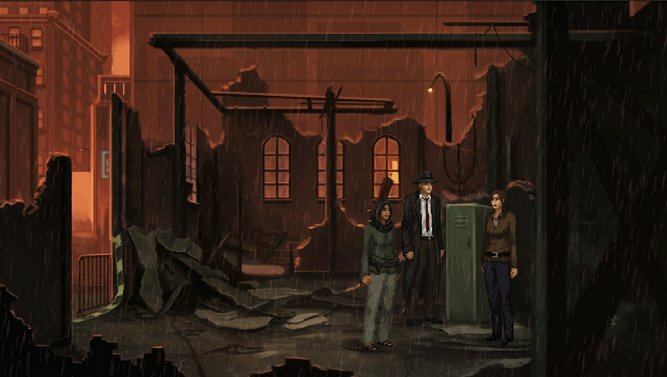 Unavowed is the latest offering from Wadjet Eye Games, and the first original work from Wadjet Eye owner Dave Gilbert, since The Blackwell Epiphany. Let me just preface this by saying that the only Wadjet Eye game I've played before this is The Blackwell Legacy, and that was a while ago, so I'm not overly familiar with their games, and can't really compare Unavowed to any of them. However, from what I'm seeing, if you enjoyed the Blackwell series, I can't see any reason why you wouldn't enjoy this. 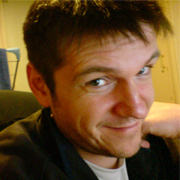 With that in mind, let's… talk about Unavowed. It's a little different to your standard adventure game in that it bills itself as incorporating elements of the RPG genre into the mix. I'm not overly familiar with RPGs, but basically this means that you don't really play the game as any specific character; instead you kind of play as yourself. More on that later. First of all, it's a low res retro style game made with the AGS engine, so upon launch you get the option to open a config utility where you can play around with the resolution, scaling, and mouse speed options, among other things. I had to up the mouse speed a tiny bit as it was lagging a little in game. In-game there are several more options for voice and text and volume - the usual things. After starting a new game, we're greeted with a little cut-sceney type scene atop some tall building. There are three characters, and they're all shrouded in darkness. It seems one of us is possessed by some kind of demon, and another of us is attempting to exorcise it. Hmmm, not bad so far. I'm intrigued. After that mini-intro is where the RPG elements kick in. We are asked to decide if we're man, woman, or demon. You can't pick demon because you're not allowed to remain possessed obviously, so you must pick man or woman. I picked man because that is what I am. Some more dialogue from exorcist guy, and then we're asked to input our name. I inputted Dan because that is my name. More taunting of the demon from The Exorcisor follows, and then it starts to get even more intriguing. We're asked to remember something of our past. Specifically, what did we do as a job? Were we an actor? A police officer? Or a bartender? Now, the choice is important here because whichever you choose, that's who you're going to play as for the rest of the game. The characters will make reference to your past role, and some dialogue options will be different too. So, what's the game about? Well, basically we became possessed by a demon about a year before the opening rooftop scene. We find out the specifics of that possession in a playable flashback. And each character option has a different flashback. I checked them all out briefly, but I ultimately opted to play as the police officer. After the flashback scene, and our ultimate de-possession, we learn that our possessed self had been running all over town for the past year committing all manner of horrible acts. The police think it was us, so we're now a wanted fugitive. Can't go back to our old life, so what's a de-possessed ex-copper to do? Why, join the Unavowed of course; a group of magical supernatural investigators who have been around for many many MANY years. Eli and Mandana - our two de-possessing friends - work for the New York branch. Eli is a fire mage, and Mandana a jinn. The head of the New York branch is Kalash, Mandana's father, and a real old dude with lots of muscles and a blue complexion. He's wise, and knows what's up! We move into the Unavowed's headquarters, and this is where the real game starts. Kalash calls us into his office and briefs us on a mission. It seems that supernatural activity has been steadily increasing over the past year so the Unavowed has gone from investigating disturbances once a month, to each and every day. Our first mission is simple. Something went down, down at Astor Place, in The Village. Something bad. Something nasty. Something.....supernatural. Who ya gonna call? Well, nobody, because it's us, and we're already on our way. After this first mission, it becomes clear that what we're really doing is tracking the old demon that possessed us. It's still out there, and it's still up to no good. Every time we visit a place, we're treated to little visions of things we did when we were possessed. These help fill in the story for us, as well as provide clues as to what we need to do for each mission. So, it's time to really start playing. It's the standard adventure game stuff - put your mouse cursor where you want to go and click, or hover over an item to interact. The cursor icon changes a little depending on the hotspot and what you can do with it, and you only have to worry about left clicking because that is your only option in performing any actions. Details of the hotspot are conveniently displayed at the bottom of the screen when you rollover - no extra clicking required - pretty nice and simple. Dialogue options are plentiful, and talking to characters operates in a couple of ways. Sometimes it's a straight up linear conversation whereby we are presented with options to choose from, then the other person replies, we choose again, they reply again, etc etc., until it's over. The second way is your usual dialogue tree variety; choose a line of questioning, and exhaust all possible avenues. It's all perfectly normal, and works perfectly well. What about the puzzles, I hear you screaming? Well, they're pretty basic inventory style puzzles - pick up all the items, and figure out how to use them, to achieve what you need to achieve. The cool thing though is that since we're not working alone, we can use our companions' special abilities to aid us in our puzzle solving. For example, Mandana is a whiz with a sword, so she can chop, slice, and pry things open for us; and Eli has the power of the sun at his fingertips, so can burn and melt whatever it is that we need burning and melting. He can also read old books and notes that were consumed by flame; not a bad little trick there Eli. As we progress, and are mindlessly wandering around, figuring things out, Eli and Mandana chat idly to each other about all manner of things, which allows us to understand their relationship, and their history. We also get the chance to question them in between missions, and find out a little more about each of them, which helps flesh them out for us. Also, it turns out that the New York office is having a recruitment problem, so as we play, and complete our missions, we meet other "void-touched" people - people with special paranormal skills - who we can invite to join us and complement the Unavowed. This is where the RPG elements come in even further, because once we start adding to our ranks, we then get the opportunity to choose from the roster of skilled allies whenever we go out on a mission. We can only take two with us though, so we have to choose wisely who we think will be most useful for the current mission. I'm not sure how much this is set in stone - I was able to go back and change a character on one occasion, but not on another. Either way, it's a cool little mechanic that adds a little more variety to the puzzle solving, and to the story overall. And that is Unavowed thus far. In conclusion, the game looks great, the voice acting is top-notch, the dialogue is spot on, the audio is sound, the puzzles don't seem too challenging, and the story feels like it's going to be interesting and exciting. One thing you might find odd is that that our character doesn't have any recorded speech. This is just because we are the character really, and I guess it wasn't practical to have to record three distinct sets of virtually the same dialogue for each of the three characters, as well as male and female for each. It's not a major issue, but it does make you feel just a little bit detached from the game at times since everybody else around is speaking. All in all, I'm having a great time, and I look forward to the full release later this year. What a treat to get to read a preview of this game. I'm really looking forward to playing it. Thanks so much, Dan! Thanks for the info Dan and Jenny! Thanks Dan great article. This is one heck of a game..
Last edited by Winfrey; 05/20/18 01:07 PM. Dan Peach is doing game reviews at GameBoomers now? Hi Dan! It only took me nearly a year to get him to say yes, Greyfuss. Thats one tough Peach to crack. Hey GreyFuss. Long time no chat. Hope you are well. Remember the 'good ole days' Dan? Hmmm, vaguely. I'm much more jaded and cynical now. Sounds like a Tex Murphy adventure. Any idea when this game will be released? Sometime in summer, I believe. As a tester, I can confirm it is a great game indeed, definitely on par with all the 'Blackwell' series! But I can't say it is 'a low res' game - rather, it is a 'high-res' AGS game The screen resolution has grown to 640x480 for the first time for Wadjet Eye, and it looks gorgeous on 1920x1080. Well yes, it's look great, as I said. But I was referring to its style being reminiscent of older games, like all Wadjet Eye games are. The AGS config utility says its native resolution is 640x 360, which seems pretty low res by today's standards. It's not a complaint, by the way; just a fact. Thanks a lot for the preview, Dan Peach. This is one of my most anticipated games right now. Looking forward to its release this summer. I like the idea of creating my own character. I don't think I'm going to play as "myself," although I probably will play a female character with the actor background, so we'll have some things in common. It sounds a lot more ambitious than any game they've done so far. I really like the fact that the missions can go differently, depending on the characters chosen. "The audio is sound". Nice line there. Hi Dan, and thank you for the detailed preview! Nice to have something interesting to play this summer. Last edited by Mikael; 05/23/18 10:35 PM.